My kids have a lot of big emotions so we have been talking about them a lot lately! In October for Virtual Book Club for Kids we are reading Llama Llama Red Pajama by Anne Dewdney and baby Llama gets really mad at his mama... so we've been talking about that! 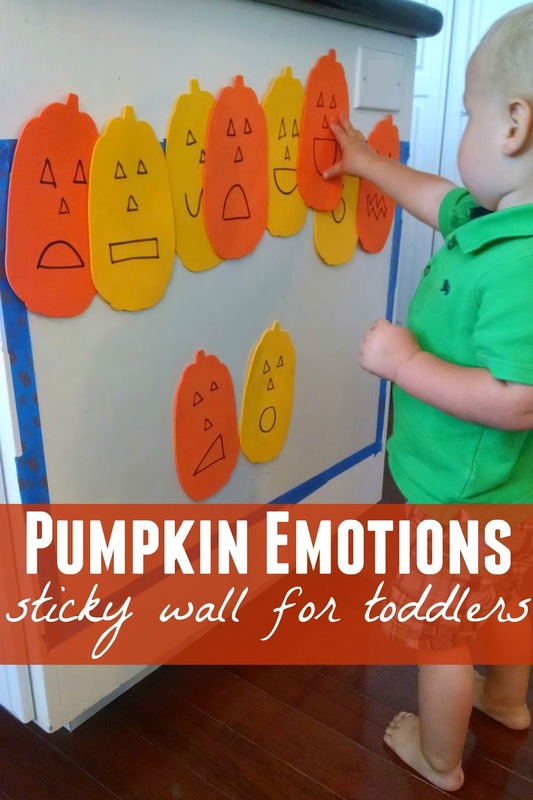 Using a pumpkin theme we made a pumpkin emotions sticky wall to help us talk about a few different emotions. The emotions we have been focusing on are super simple: sad, mad, happy, scared, and surprised. To get started you need to stick some contact paper, sticky side out, onto a flat surface (wall, table , or floor) and then tape the outside of the contact paper in place using painter's tape. Next draw some faces on your foam pumpkins using a sharpie. 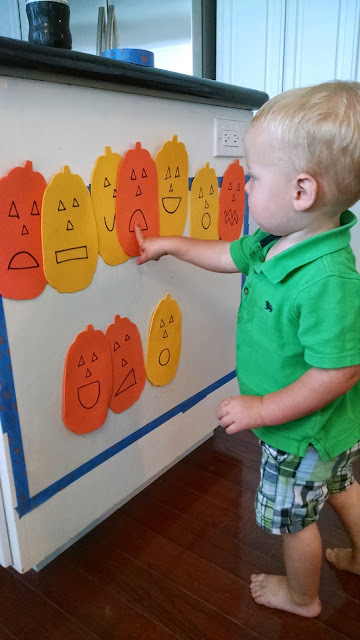 Try and make the faces portray different emotions- happy, sad, surprised, mad, and scared. 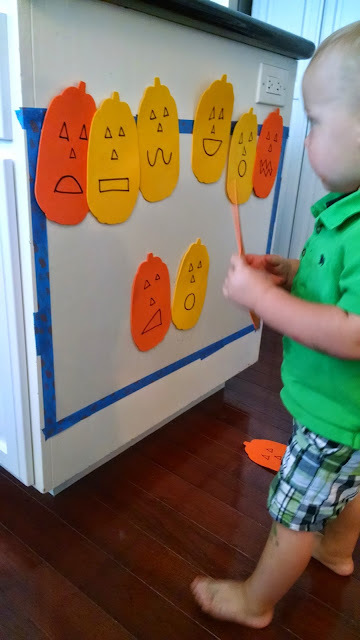 Next have your child stick the faces onto the sticky wall while trying to identify the different emotions on each face. Move them the faces around as you play with them. We had fun singing, "If You Are Happy and You Know It" while playing this game and adding in additional emotions besides happy. Jean Warren over at Preschool Express has some great songs about Feelings if you need additional ideas. I especially love the feelings song to the tune of Twinkle Twinkle Little Star. Talking about emotions is important for little ones because as they learn to identify feelings in others and themselves it helps them learn to regulate themselves a bit more and helps you know how to help them better. When my toddler is able to state, "I'm mad" it will often calm him down a bit because he is able to express how he feels and I am able to help give him alternative suggestions for showing his mad feelings... besides being physical or throwing a tantrum. It is a win, win! 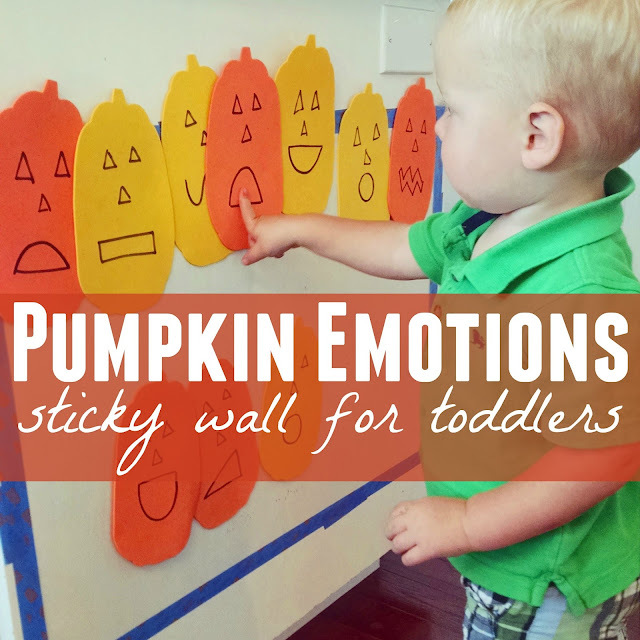 AHA Parenting shares some additional great ideas for Helping Toddlers Learn About Emotion HERE. 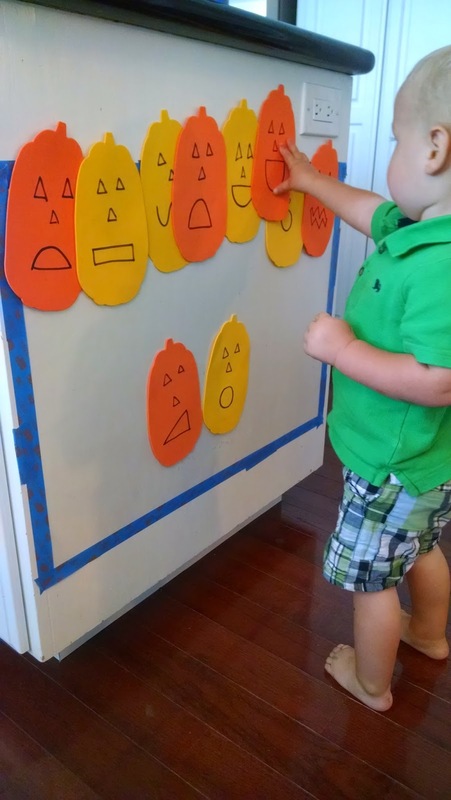 Do you have any additional fun activities or strategies you use to teach kids about emotions? We love this collection of ideas for teaching kids about feelings from One Time Through. Next week we will be having fun with SPIDERS & WITCHES! !